Finally! The second Scandinavian Star tutorial is here! **Important Note: The woven star is a very old traditional pattern that goes by many names. Here is a picture of a Swedish Window Star that has been in my friend's family for nearly one hundred years! Isn't it stunning? 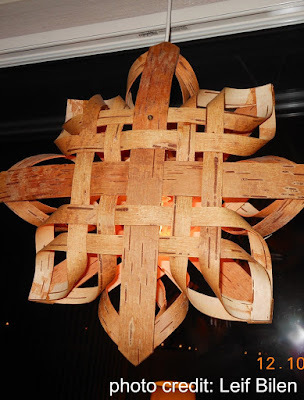 People have been weaving similar versions of the woven star for a long time. Most commonly, I see it called a Finnish Star. You may also see them called Advent Stars or Window Stars or Poinsettias. The woven star concept is an idea and ideas cannot be copyrighted in the US. A person can only copyright their own expression of an idea. For more information, see this important post about copyrights and why I refuse to be bullied and intimidated into removing my own expression of the process for creating this star. If you have created your own tutorial of a traditional craft, and are receiving threatening, bullying, or intimidating emails to remove your tutorial, I would urge you to know your rights and to seek the advice of an attorney. Let's not allow the bullies to win. I am not an attorney, and nothing I have said should be construed as legal advice. Do you all remember the first woven star tutorial found here? I love these traditional stars! This star has more strips woven together than the previous star, creating a fuller looking ornament. Basically, you need to follow the instructions for the original star, but instead of using six strips per ornament side (for a total of twelve strips per ornament), you will use ten strips per side, for a total of twenty strips per ornament. When you weave your sides together, they should look like this. You will needs two "sides" like this to make one star. Secure each intersection with a tiny drop of clear drying glue just like you did for the original star. Next, you will create the star's "points". Do this by gluing together the ends of adjacent corner strips. Remember to put a twist in each strip before gluing, just like I showed you in the first tutorial. In the original star, you just glued one set of strips per corner, but for this star you will glue two sets per corner, as shown. Use clips to secure the points until the adhesive cures. Do all four corners, or "points" the same way. *note: I have seen some people doing their corners a bit differently, gluing all four strips of each corner together. It really turns out pretty! Get creative and have fun with it. Once the glue has cured, and you remove the clips, you should have two "sides" that look like this. Now, you will put the two sides together just as you did for the original star, rotating the top side 45 degrees, so that the "points" from the two sides are offset, to form what will be an eight-pointed star. Weave the remaining strip on each side through the points on the other side, as shown. Glue and clip. Continue until all the points have been secured. When the glue has dried, remove the clips. Create a hanger, as shown in the original tutorial. Embellish as desired, or leave your star plain. I chose to add a bit of glitter and tinsel to mine, as well as a fringed rosette for the top of the star -- this helps camouflage where the hanger was secured. Watch for the third star! If you are not already a follower, you may want to to click on follow in my side bar, so you're sure not to miss the third installment. In the third installment, we will be making this delicate looking star. 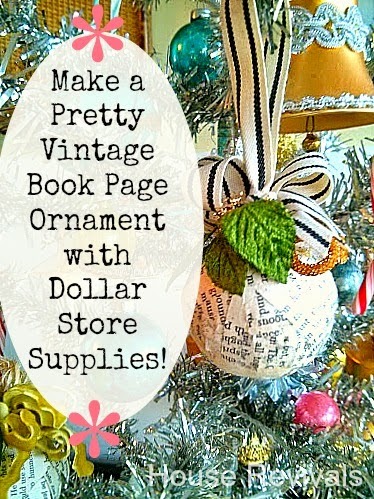 You might also like this post about making book page ornaments with dollar store supplies. If you enjoyed this post, please subscribe to House Revivals in the sidebar, so you won't miss the fun projects we have planned. Find us on Facebook, too, so you can catch all the "in between" stuff, and see what I'm working on throughout week on Instagram. Feel free to link today's project to your favorite social media sites. These stars are fantastic! I can't pick a favorite- they are all so pretty! Thanks so much for sharing at Holiday Hookup! Stunning!!! I would love to share your work in a post on my blog, with permission to use a photo, giving you credit and linking to your post and a separate link to your tutorial. I think these are marvelous and if I have time I would love to try making some before Christmas. Thank you for sharing your wonderful technique. Oh my goodness....What a neat idea. I wasn't looking for another project but who can resist these beautiful stars. Great tutorial. Thank you. Wow! How terrific! I think I know what to offer as a craft to make at my next woman's craft nite! Thanks! Thank you for sharing. It's lovely! I want to give it a try! Here I am flabbergasted with this beautiful star! That delicate work very, very cute! I like the details ... I'm thrilled! These are so pretty! I have made these before out of strips of paper, but never thought to use printed book pages. I love the vintage look it gives them. I'm getting so hooked on all these wonderful paper ideas out there-I haven't seen this one yet-it's really neat! Oh.my.goodness! Stunning! So delicate and absolutely beautiful. This is amazing! Very impressive work!!! There are AMAZING! Most definitely I will become a follower . . . These would make a wonderful garland, tree decorations, package decorations....possibilities are endless!! Come over and visit sometime! You're a great teacher, Amanda! These are absolutely stunning!! Another paper ornament I want to make!! !!!!!!!!!!!!!!!!! Oh my goodness, these stars are amazing !!!!!!!!!!!!!!!!! I need to find some little clippy things and then I will be making them!!! Those stars are gorgeous. Your tutorial is great. Thanks for sharing. These are amazing! I made a Christmas tree from book pages, and I totally think I am going to do these also. Love it. What a great post! Thanks for linking up at tatertotsandjello! I'd love for you to check out my blog! and maybe give some bloggin' love! wow! that's fabulous! I'm not sure I have the patience though. thanks so much for linking up and linking back to me. Stunning! I cannot believe you don't have a list of comments a mile long! These are the best things I have seen in a long time! What a pretty star...it would make the perfect gift for a book lover. Gorgeous!!!! It doesn't look easy to make at all yet you explain it so well i feel like I can (and I will). That is a really beautiful ornament. So detailed...I want to make one (or ten). So pretty. Thanks for linking to Tickled Pink. Oh my goodness! Those are incredible! So beautifully done...so refined! So glad I saw your feature on Tickled Pink at 504 main! I like the old book idea. I'm going to try it with sheet music! 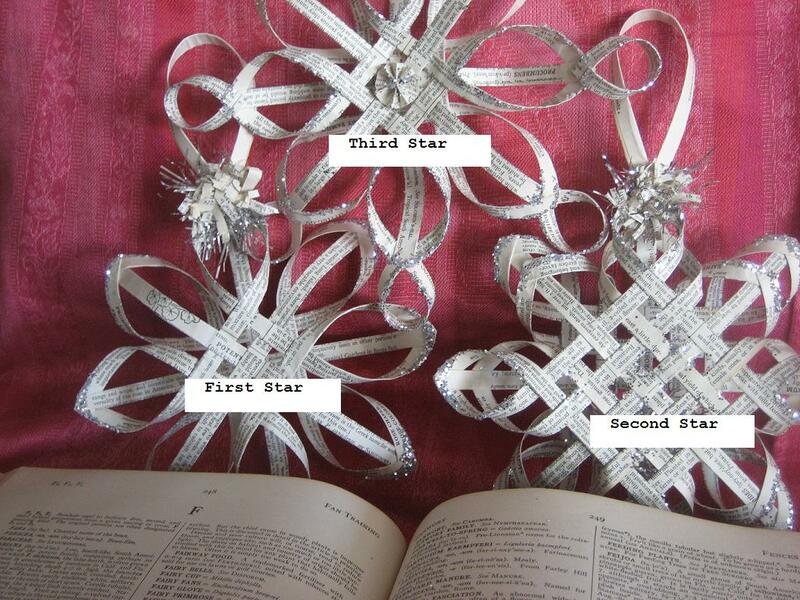 I came across this looking for inexpensive ways to make Christmas ornaments. Thank you for doing the tutorials. I love all three of the versions and plan to try all of them. The best part, it's paper! If I mess up, I haven't wasted money I don't have right now on expensive supplies. I honestly believe that you just provided me my answer to Christmas gifts this year!! Sooo pretty!!! how long are the strips for the 5x5 star? Gosh, those ornaments are pretty. Thank you for posting the tutorial. I'm going to have to make some for Christmas this year. Прекрасно! Мне очень понравилось. Большое спасибо! Thanks for the tutorials and the stand against bullying! You go girl! Found this on facebook earlier this evening. Just waiting for the glue to dry so I can put together the 2 sides. I'm making star 2. Be careful -- these stars are addicting! I would love to see your finished stars! These stars are gorgeous!!!!! I must absolutely make them for the coming Christmas! No problem! Have fun making them!